Today Koki and I took the train into Tokyo to meet with the staff of Kurkku and Artist Power Bank to discuss the two upcoming events: a story and music show with booksigning on Wednesday night in their bookstore, and a two-day retreat at a mountain campground near the town of Doshi. The staff shows us the three stores and two restaurants that make up their complex. that’s Koki Aso on the left. Beautiful Tomomi will translate for me when I do my show. Lovely Junko, on the right, is vice president of Artist Power Bank and coordinator for all of the activities I will do with Kurkku. 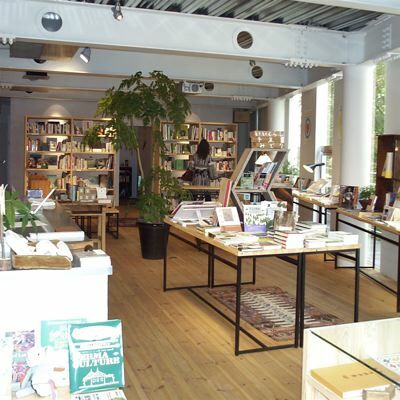 Here’s their spacious, gorgeous bookstore, The Library. 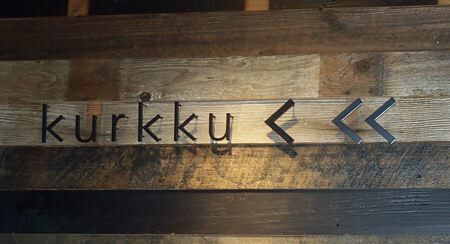 The building was created of sustainable materials and designed specifically to house Kurkku and Artist Power Bank. 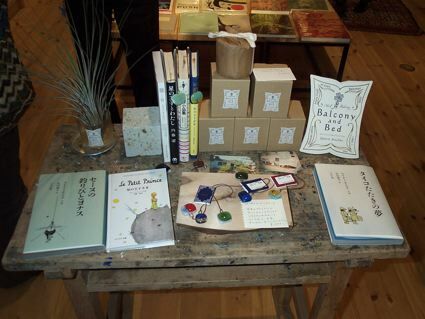 In The Library, a display of bookmarks, candles and books on a beautifully worn antique table. The Library specializes in sustainability and art books for adults and children. 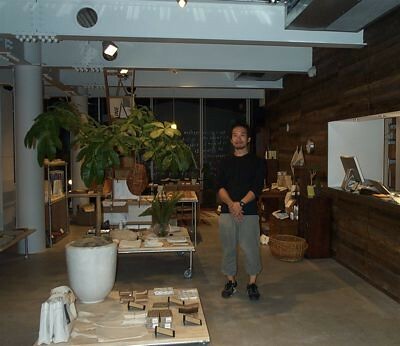 Here’s their earth-friendly goods store, The Green Shop and its creator. Soccor balls from recycled materials, clothing, accessories and shoes of organic cotton, recycled matierials and hemp , durable natural cookware, everything longlasting and of elegant design. 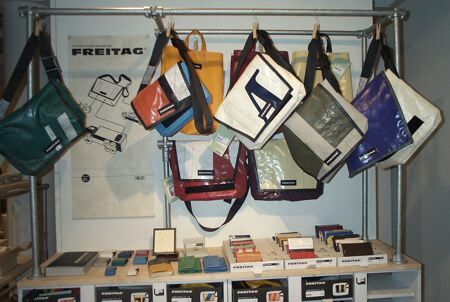 In The Green Shop, you can buy wallets and tote bags made from recycled waterproof truck tarps made of bright colored, fashionably distressed materials. 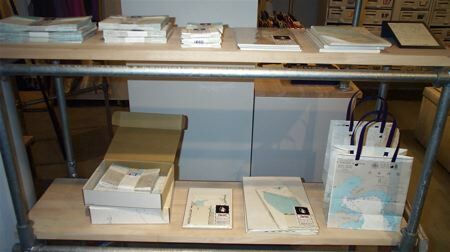 The Green Shop also carries a line of stationery and gift bags made from waterproof nautical maps, which, because of changing coastlines, are discarded and replaced with new maps every few years, creating an ideal material for stylish recycling. 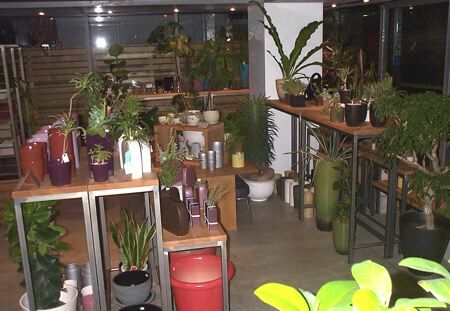 Here’s their gardening store, featuring unusual potted plants suitable for city living, plus small scale organic gardening supplies and equipment. 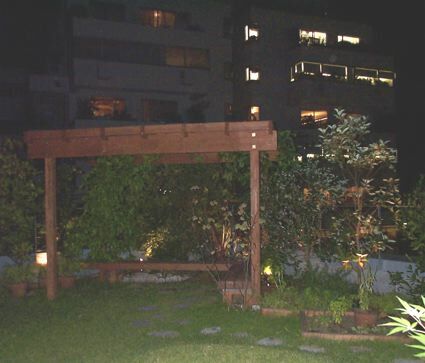 Above the gardening store is their cafe, and above that, a roof garden with a gazebo. I asked if anyone had been married there, and the staff said no, but suggested maybe I would like to coordinate some green weddings for them. 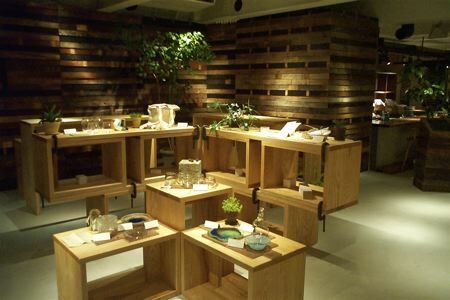 And here is the elegant restaurant where we had our meeting, with hand-crafted glass and ceramic gifts for sale up front. The wood wall covering was recycled from a partially burnt building. 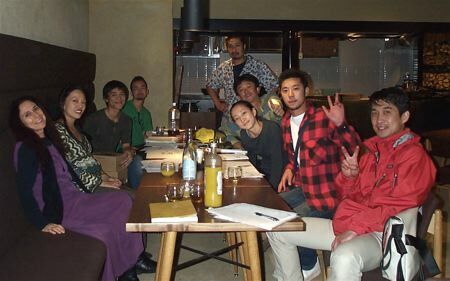 I discovered a group of highly intelligent, creative and friendly people working at Kurkku and Artist Power Bank, both organizations founded and funded by reknowned record producer Takashi Kobayashi for the purpose of spreading environmental principles and information to help save the planet. I would get to know them all better in the week to come.